Despite a long time in the making, Cooper has finally reached his glory, not only for his latest masterpiece, but also as a multi-instrumentalist who has paid his dues and is now reaping the benefits. Cooper can look back on his twenty-plus years in the business, while looking ahead with confidence as an accomplished musician in the industry. Hired for the eleven song compilation are friends of Cooper’s and musicians who he has known for two decades, as well as people in the Grateful Dead community who share his vision and believe in the spirit of the jam. On the first track, Dance The Night, Cooper brings a New Orleans influenced sound to the table. June Core’s drums lead us into a swampy, bayou-blues jig that is reminiscent of an early jazz tune from the ‘40s. Core is a monster drummer with amazing chops and Cooper is lucky to have him in the mix. On vocals is Bundy Brown who sounds right out of the south and has an easy voice to listen to. Ben Ellman’s baritone sax has a full sound while he holds those deep notes throughout the solo. Jim Lewin’s lap steel can be heard clearly in the background as he fills in the gaps nicely. Lachlan Kane’s bluesy comp-notes and walk-down piano lines are perfectly executed and compliment the song well. Down In The Slough is a fun, country tune that spotlights Barry Sless’ pedal steel and it’s something you might hear in a Texas bar. On lead vocals is Al Frisby who brings a zany and raspy edge to this track. The song reminds me of a Leftover Salmon ditty, but Cooper has created something all his own. The third song features Cooper on lead vocals and drums. This one is an ode to “Put The Lime In the Coconut” and titled appropriately, Golden Coconut. Accompanying Cooper is Bill Payne on piano, Matt Hartle on lead guitar, Keith Hamm on slide guitar, Danny Pouw on bass, Henry Hawk Harris & Phil McGee on harmony vocals, Ray Hauck on conga’s, tambourine and Will Kahn on percussion. There’s a lot going on in this song including a danceable, New Orleans back-beat with perfect stops and hits. Driving this track is clearly the percussion of Hauck & Kahn. Girl In The Garden is my favorite song on the album. Maybe that’s due to Keith Hamm’s guitar work, Phil McGee’s vocals or the fact that it’s reminiscent of Tea Leaf Green and Assembly of Dust. This is the sound I look for in a production and one I could listen to over and over again without getting stale. Danny Pouw’s bass-tone hits sweet spots during the solo and it’s the backbone of this song. Nothing Comes For Free features Dale Ockerman on piano and Jerry Brown on harmony vocals, two of Santa Cruz’ finest musicians. Al Frisby’s lead vocals are perfect for this type of Rag and Cooper’s guitar work is stellar. If that wasn’t enough, Cooper also plays bass, drums and sings back-up vocals. So right So Long is eloquent and smooth. Bundy & Tammi Brown’s vocals give it that finesse and grace which make it an enjoyable song. “Mighty Mike Schermer’s” guitar work is spot-on especially in the beginning, but I think his solo gets cut way too short. At only 3 minutes, this track could have been stretched out for another 45 seconds. Playing My Part is another favorite of mine probably because Cooper’s vocals sound like Mike Gordon from Phish. This song has a catchy chorus and beautiful backing vocals by Sheila Golden. On lead guitar is AJ McKinley & Scott Cooper, and like no surprise, he’s playing all the other instruments. The song builds and builds until the vocals light up and take us out in the end. Play Her Song was written by Cooper & Jim Brighton, one of the original members of Stack A Bones, Cooper’s previous band. This song also features Gary Gates on vocals, a bay area musician and friend. Accidentally Like A Martyr is a well-chosen Warren Zevon cover. Matt Hartle’s guitar scream’s with emotion right from the beginning and never lets up. Jerry Brown’s vocals are inspiring just like Lowell George. Steve Sofranko’s organ is as gospel as a church choir on Sunday morning and I urge everyone to play this song loud with all the windows open on a hot, sunny day. It will leave you breathless and happy with the music that has been created here. Caboose On The Loose features Barry Sless on pedal steel guitar with Scott Cooper on everything else. Bye Bye is fitting for the last song and has Keith Hamm on lead guitar. Cooper’s vocals are fun and could certainly be played on the radio. Recorded at Paradise Recording Studio in Santa Cruz the engineering credits include Will Kahn, Rich Williams, Eric Bates, Elina Bass, Gary Martin, Keith Graves and Doc Wiley. Mastered by Brad Sarno at Blue Jade Audio, the tracks are clean and professionally done. 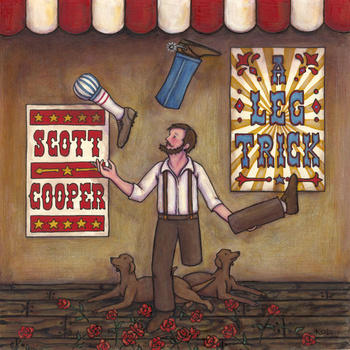 A Leg Trick is a nice accomplishment for Cooper who is thankful for everyone who made this production possible. Cooper has a lot going for him these days playing in multiple bands and doing what he wants to do in life. Original songs are what drive him presently and it’s a nice charm to hear him play, compose and sing. Congratulations on the new album, it’s quite an impressive production. With the amount of musicians with you, it must have been some complex process from beginning to end. Yes, thanks, that’s an understatement. They say it takes 20 years to come up with your first album and then one year for a follow up! That’s what happened to me, and I am already working on the second CD. One track was recorded in the early ‘90s and never mixed. Another one was done at the same session, but, then I totally tweaked it about a year ago. I took out a verse, extended it elsewhere, redid the vocal and guitar tracks, took out the organ, added percussion and put in Bill Payne. The bass and drums were done 20 years ago. The other songs were done in bits and pieces whenever I could. The title of the album, “A Leg Trick” seems unique. I write a lot of different material, some of it is Soul, Jamband, New Orleans, Country and Bluegrass. I just figured it makes more sense to put out a cd that is consistent in sound. The next album will be an acoustic version and this one is the “Electric” CD. Using a play on words, I came up with “A Leg Trick”. My other band Stack A Bones, was going to do the same thing, but didn’t use either of those titles. I tried to find a photo of one man juggling his own leg, but couldn’t come up with anything. So, I ended up using Kristina Layton from Colorado for the artwork. Before we talk about your involvement in the bay area music scene, take us back to your early experiences with music and how you became such a multi-instrumentalist. I took drum lessons when I was 13, playing in the junior high school band and hated it. In high school, I was very into George Thorogood among other stuff. So, for some reason I could play a good shuffle and a Bo-Diddley beat. Some blues guy in Madison Wisconsin when I was 18 realized that and started hiring me to play in his band. I moved to Santa Cruz in 1986 and started playing Callahan’s Pub which used to have an open blues jam and I quickly became the house drummer. When Johnny Shines was doing a tour in ’89 he used basically the house band from Callahan’s to back him on the west coast tours. I played drums with him and then started getting involved with Rusty Zin, Mike Schermer and that gang. I have always played a little guitar in one form or another especially just messing around a campfire. I never really took formal lessons, but self-taught myself by being around some really good players. I picked everyone’s brain about playing the guitar. I started on the guitar in a band towards the early ‘90s as an acoustic trio just for fun. At some point, there was a bass lying round and I decided to pick that up. In Stack A Bones, I played drums with some really great guys. That band took a break and then resurrected into an acoustic lineup with me on bass. I got good enough as a bass player to stop playing drums and it got to a point where I could bring songs to the band. On drums that was hard to do. When you are a drummer it’s hard to show the guys what your ideas are on the drum kit. I picked up a little piano and just enough to play in the studio. In the band The China Cats, I started taking my playing more seriously. Well it’s no mystery that you are really connected to the music scene here. On the new album, the song “Girl In The Garden” was a favorite of mine. Mostly because it has a Tea Leaf Green and Assembly of Dust influence – two bands that I gravitate towards. What was the inspiration for that song? I saw Jerry sing the song Standing On The Moon and after seeing it performed with the Dead, I was sitting in my garden playing the guitar thinking about those changes in the song. I came up with the idea at that moment. The song was recorded in the mid '90s, but never mixed until last year. Looking back, what really stands out personally for you in the making of the album? Working with the artist Kristina was a joy, I love what she does and the paintings she puts out. I am thrilled to have great musicians working with me, but Kristina is wonderful. There is a tune on the album called So Right So Long in which every artist just nails it! When that happens, when everything comes together, I feel blessed. Bundy Brown sings on a couple tracks and got them on the first take. That’s always great. I’ll never forget seeing Barry Sless in the studio playing the pedal steel guitar. It was really eye-opening to watch him play with both hands doing something, while coordinating foot pedals and knee levers at the same time. It was a sight to behold. What about the coming year for you Scott, what’s planned for 2012? I have some solo gigs planned to support this, but don’t want to necessarily go that route. Additionally, the China Cats don’t want to do original material and some argue that a tribute band shouldn’t do that. The solo thing allows me to play my own tunes. Whenever Bill Layman and Jim Lewin can get some time, we have a side project called The Secret Chimp that we play a few times a year. That band gets to do original material which is the most rewarding aspect. It’s like me asking a gourmet chef to make a plain hamburger, if you know what I mean. Yes, I get it, you certainly are a gourmet chef Scott. Good luck in the coming year.